Asaro and Lamari rivers both flow into the Purari which is one of PNG's five major river systems. The Yonki Hydro-Power Station is fed by the Ramu river. The Province is entered through the Kassam Pass and exited to other Highlands provinces at Daulo Pass. Kassam Pass has views of the Markham and Ramu valleys, while Daulo Pass has views of Goroka's green valleys. Grasslands dominate a broad area of land especially in the valleys which are predominantly inhabited by people. This is a result of continuous burning and excessive use of the land to do gardening. 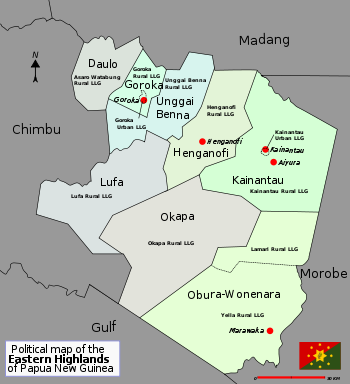 The population distribution among the eight districts of the province ranges from Obura/Wonenara with the lowest population of 29,688 to Kainantu with the highest population of 1. 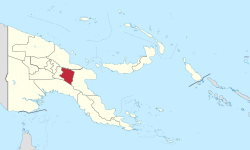 [clarification needed] The capital of the province, Goroka town has an urban population of 19,523 which is 27% of the Goroka District population of 71,870. The other major town of the province, Kainantu town, has an urban population of 6,788. About 94% of the population live in the rural areas. Eastern Highlanders attend to their food gardens and livestock while the educated individuals find work in the cities or towns. Intermarriage by Eastern Highlanders to people of other provinces and cultures is a common trend. There are many people from all over the country and expatriates who have made this province their home either because of work or marriage. There are various ways in which traditional cooking is done, either by using bamboos, roasting sweet potatoes in the open fire or the ground oven style of cooking called "mumu". Vegetable gardening and tending to livestock is very important to the village people as this is their source of wealth and identity. [original research?] Vegetables and livestock are given as contribution during funerals, marriages and other festivities. As with any other transitional society, (moving from traditional times to suddenly be competing in the 21st century, on the free market), the Eastern Highlands has witnessed its fair share[clarification needed] of law and order problems. Most problems stem from the fact that the majority of the youth are not engaged in gainful employment or other productive activity. Most problems relate to petty theft and pick-pocketing. Visitors are therefore advised to leave all valuables in their hotel deposit safe And further carry minimal valuables on person whilst moving about. When traveling on PMVs or to unknown areas, visitors should speak to officers at the nearest police station for a status report on their destination. This page was last edited on 10 March 2019, at 06:08 (UTC).